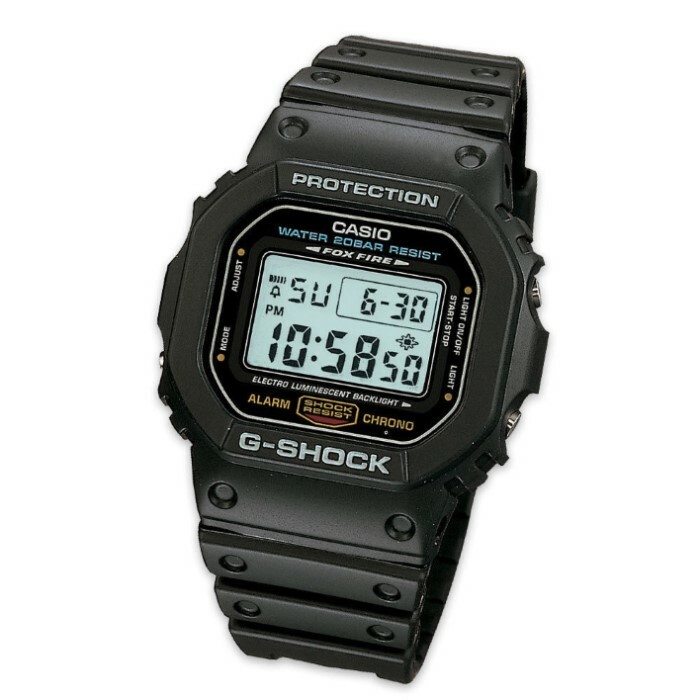 Casio G-Shock DW5600E-1V Watch | BUDK.com - Knives & Swords At The Lowest Prices! Casio G-Shock construction is tough, shock resistant and water resistant to 200m (660 ft.). This shock resistant Casio G-Shock watch also features EL backlight and afterglow functions, a multifunction alarm and 1/100 second stopwatch. Black with black band. This watch is a steal! I bought this watch before at Walmart about 5 years ago and it still works brilliantly. Paid $60 for it then and to find it here for $34 is just a down right steal. You won't be disappointed with this watch! Had one of these watches growing up through the 80's. Lasted until '95. Watch was dang near indestructible. Loved it the whole time I had it. Found it here on Bud K and it's the exact same watch and I still think it's a great watch. Excellent for the money.